Issa Hayatou's status as the FIFA's senior VP elevates him to acting president during Sepp Blatter's suspension. With Sepp Blatter suspended, the top job at FIFA falls automatically to Issa Hayatou, the son of a sultan from northern Cameroon who has ruled African soccer for 27 years. FIFA said Thursday that Hayatou’s status as the body’s senior vice president elevates him to acting president during Blatter’s 90-day suspension. But he comes with his own set of baggage, including previous corruption allegations and a reprimand by the International Olympic Committee. The 69-year-old Hayatou also has health issues, managing a serious kidney illness that requires regular dialysis sessions. Hayatou is currently in Cameroon and is expected to travel to Zurich immediately. Blatter and UEFA President Michel Platini were banned by the FIFA ethics committee after a Swiss criminal probe into whether Blatter misused FIFA money by making a $2 million payment to the Frenchman. Hayatou’s ascension to the top job comes 13 years after he challenged and lost to Blatter in an acrimonious FIFA election. The former physical education teacher and athlete comes from a well-connected family – his older brother was prime minister of Cameroon – and he became secretary general of the Cameroon Football Federation at 28, the head of the sports ministry in his mid-30s and president of the Confederation of African Football by 41. He is a veteran of FIFA affairs but so far he has managed to avoid the corruption scandals involving other senior figures, although not without also being targeted by accusations. 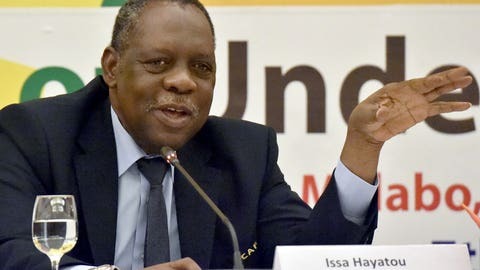 In 2011, Hayatou was officially reprimanded by the IOC, of which he is also a member, for receiving $20,000 from a sports marketing company in a FIFA kickbacks scandal. Hayatou claimed the money was used for genuine development programs by his African soccer confederation. He was also accused, along with another African official, of accepting $1.5 million in bribes to vote for Qatar to host the 2022 World Cup. That heavily tarnished vote is a focus of one of the investigations by U.S. and Swiss authorities into long-running corruption at FIFA. Hayatou denies any wrongdoing, as does Qatar, and his response to the accusations, like any criticism of him over the years, has been to hit back. He denounced allegations of vote rigging by a British newspaper as Western bias. The combative style has served the tall, heavily-built Hayatou well in African soccer, where a show of strength is often a successful tactic. Once faced at a news conference with an uncomfortable question regarding his voting history at FIFA, Hayatou responded by staring the young reporter down and questioning his age and qualifications to challenge a senior official. Despite being the most senior executive at FIFA after Blatter, Hayatou said he ”will not be a candidate” for the presidency in the Feb. 26 election. Platini was considered the front-runner to be Blatter’s successor, but the suspension could prevent him from running. Another possible candidate, Chung Mong-joon, was suspended for six years by FIFA in a separate case on Thursday.